If you have any questions or suggestions you are welcome to join our forum discussion about Trending Trading Ranges. As you know, the market is either trending up or down, or its movement is range-bound. However, often you will see a scenario when the market has formed trading ranges, but the succession of these periods of sideways trading actually composes a trend, or those were trending trading ranges. This means that despite the fact the market is moving sideways for more than 50% of the time, if the price breaks out from a trading range, edges higher, enters a new trading range, and then does that again, we actually have a sort of a trend. Here is an example of three trending trading ranges. However, a spike plus channel trend must be distinguished from trending trading ranges for a good reason – they are traded differently. A spike plus channel trend bears much more strength, which implies you should refrain from entering counter-trend positions and only trade with-trend, mostly swing trades. Once market movement stalls and reverses, or enters a trading range, you can safely switch to counter-trend positions. Unlike channel trends, trending trading ranges provide you with the possibility to both go long or short and also look for more scalps. As you already know, trading ranges are more common than strong trends, which logically leads to the conclusion that trending trading ranges can be seen more often than spike plus channel trends, in fact twice more often. In some cases, there will be not only few, rather multiple breakouts and trading ranges. When that happens, market behavior resembles more closely a stronger type of trend, meaning you should stick to with-trend trading. 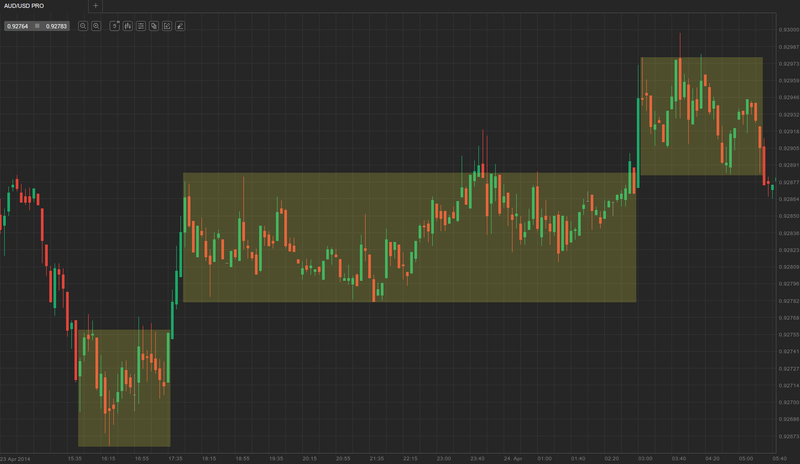 After the second trading range begins to form, a pullback usually tests the earlier trading range. The test often ends with the price entering the previous trading range, but if it does not, then the trend is considered stronger. In some cases, the test leads to a breakout beyond the previous range, thus market movement has reversed. Generally, because entering on the breakout from a trading range is a low-probability trade, it is much better to enter on a breakout pullback or on a reversal from the opposite side of trading range. However, if the trader is sure that the market is forming trending trading ranges and the breakout seems highly probable, he can enter during the formation of the breakout, at the close of the breakout bar or at the close of the next bar, if it is also strong and confirms the breakout. Usually breakouts are a spike that is followed by trending market movement bound in a channel. However, often you can see the price stopping around the measured move area and from there begin to move sideways (the market is effectively moving from one trading range to another). Much infrequent, but still observed, is a scenario when the market forms a succession of three or more small trading ranges (multiple), which display trending behavior – this should be considered and traded as strong trends, therefore be subject to with-trend entries only. One of the difficulties traders encounter with this type of market behavior is to properly adjust to the shifts. Usually after a breakout from a trading range, market players expect the beginning of a new trend, and so they enter swing trades. However, if the price consolidates at a certain price level after the breakout, it indicates there is more sideways trading to follow as the market tests the support and resistance levels of the newly formed range. At this point, traders should move from trend trading style to range trading (basically you have range trading, followed by trend trading, followed by range trading etc). If the market finds itself in a trending trading range, traders should not trail their protective stops below the most recent swing low, because they will commonly get hit by retracements. During trading ranges you should aim to buy low and sell high, and therefore it would be wiser to exit when the market forms a higher trading range, than to exit when it is falling back to lower levels. But what is the reason for the formation of a higher trading range after a breakout? Basically, aggressive traders will bet against big trend bars in the area of the measured move target and will scale in further as the price continues to rise. Those traders expect that the large trend bars are preceding a climactic exhaustion, which will be followed by a pullback to the top of the previous lower range. Because they anticipate the bull spike to be the top of the higher trading range, shorting at the spike makes for a good entry point. Even if the market edges higher, it will eventually retrace at least to the entry price. If the trader scales in as the price continues to gain, he can exit his first entry as it later drops to the breakeven point and then move his stop to the higher entry’s breakeven point. 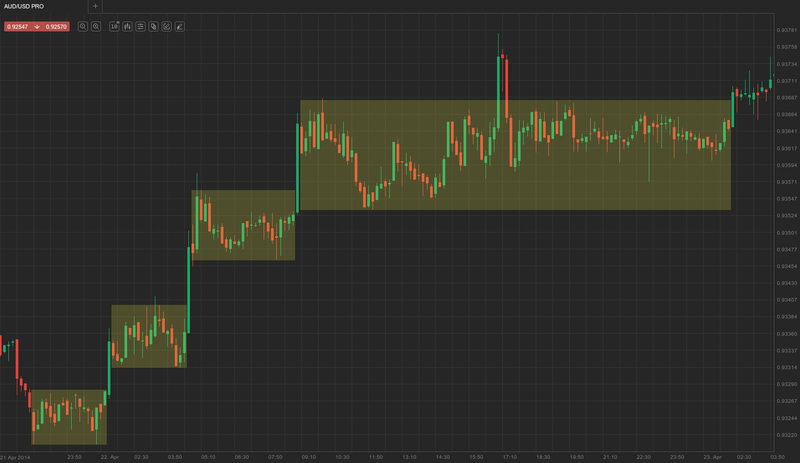 Here is an example of clearly successive trading ranges with distinctive breakouts. Like any other trend, weak trends such as the trending trading ranges also have pullbacks, which means that a trading range can overlap a previous one or even retrace back further beyond it. As we said earlier in the article, trending trading ranges allow traders to place counter-trend orders with more confidence, because the market usually tests the breakout from the previous trading range. Once they’ve determined that the market is forming trending trading ranges, market players will want to short at around 50% of the session’s average range above the breakout (if a currency pair has fluctuated in a daily range of 50 pips, then traders will look to go short at 20-30 pips above the upward breakout). Their profit target will be a move down to the breakout area or even lower – the top of the lower trading range.